There are many recipes for stuffed peppers, and a number of them are quite good. Chris and I recently assembled a stuffed pepper recipe that will challenge all others for taste, texture and palate. Now we don’t season the sirloin much with salt and pepper and the sauce we use is one we thoroughly enjoy but you can change some of the ingredients by adding or taking away, what we call season to taste. Try this recipe as is first, then put a different spin on it using our tips at the bottom of the page. Preheat your oven to 350%. While preheating, bring 2 cups of water to a boil and cook the rice until done. In a large skillet, melt the butter, add the sirloin then cook it until done with medium heat. Chop onion and cut the top of the peppers off, clean the insides out and rinse. Add the onion, salt, pepper and garlic power and mix well. Add the classic tomato sauce and stir to simmer then add the cooked rice. Continue to simmer and mix the rice until the majority of the liquid is absorbed. Place peppers in glass baking dish and fill each with the sirloin and rice mixture. Add ½ cup of water on bottom of baking dish. 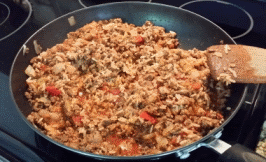 Using lean ground sirloin reduces the amount of fat left after browning. Red bell peppers give the bake a sweeter flavor. Mixing a pinch of Cayenne pepper when browning the beef will create some heat for those who like it hotter than what we have in this recipe. Adding bacon to the mixture or adding a cut slice of bacon to the top just prior to baking will give the “wow” effect for bacon lovers. Top with a bit of grated Parmesan or Romano cheese. For a Tex-Mex flair, top the peppers with Mexican cheese about 10 mins prior to removing from the oven. Blanching green peppers will give them a better consistency. Substitute garlic powder, saute the chopped onion in olive oil with two cloves of minced fresh garlic. Minimizing the preparation time is what easy everyday cooking recipes is all about, but if you have additional time and want fresh garlic use fresh garlic and olive oil when sauteing your onion. Return to Home Page from Stuffed Peppers the Italian Treat!